Super hero movies, as we know them today, must walk the difficult line of being somewhat grounded in a reality audiences can relate to while at the same time embracing (not just accepting, but embracing) the inherent goofiness of the facts of the matter. In a broad scope, this is about guys and girls in colorful suits with silly nicknames duking it out with what tends to be (at least in the Marvel Cinematic Universe) a flavor of the week villain that does just enough to further the arc of what remains to be built in this ongoing series. What grounds these colorful characters sporting strange labels is the repercussions of their actions. The Avengers can shut down an entire alien race while destroying New York in the process and widely be regarded as the heroes of the scenario, but the fact of the matter is that if this were to happen in our reality there would be thousands upon thousands dead and even more injured. With the third Captain America film, Civil War, Marvel has found it the necessary time to begin giving their heroes more heady spaces to wander. Sure, there is still a bigger antagonist than either Steve Rogers (Chris Evans) or Tony Stark (Robert Downey Jr.) in Civil War that leads to the plot being more run of the mill than I was hoping things might go, but there is enough justification and perspective to this villains plan that we go with what we're being offered. Perspective is a key word here. Not only in the driving force that puts the team at odds over the still brewing conflict concerning The Winter Soldier (Sebastian Stan), but for these superior beings to take into account the consequences of their actions and come face to face with their shortcomings-the film more or less exploring how they deal with such realizations when they're brought up as potential charges. Captain America is a firm believer in consequentialism in that his goals are morally important enough that any method of achieving them are acceptable with the understanding of the unfortunate caveat that he will never be able to save everyone. It is in exploring such territory and being bold enough to bring their heroes face to face with such a reality that Marvel exceeds in walking that difficult line. 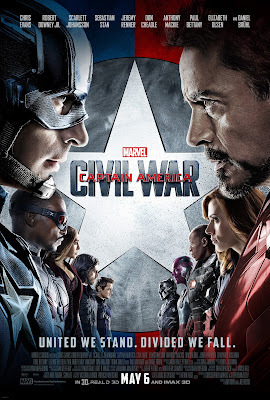 Captain America: Civil War is very much a Marvel movie in that it is full of bright colors, genuinely funny quips, and some solid action set pieces, but bringing these characters (and these performers) into more interesting dynamics with one another notches up the reality factor with the result being an admirable balancing act that deserves to be applauded. Captain America (Chris Evans) leads his team, including Falcon (Anthony Mackie), Ant-Man (Paul Rudd), Hawkeye (Jeremy Renner), Scarlet Witch (Elizabeth Olsen), and The Winter Soldier (Sebastian Stan), into battle. Almost as much as the impressive balancing act Civil War pulls off is the fact it is able to almost seamlessly handle all it has to manage. There is a ton of stuff going on here and not all of it is necessarily pertinent to the titular heroes narrative arc, but screenwriters Christopher Markus and Stephen McFeely have somehow found a way to not only adapt what had to be a sprawling comic book storyline into a single, mostly cohesive film, but into a piece of storytelling that makes all of these different characters and strings pull together in an organic fashion. Did Captain America, Black Widow (Scarlett Johansson), Falcon (Anthony Mackie), and Scarlet Witch (Elizabeth Olsen) have to finally track down Crossbones (Frank Grillo) in the fictional country of Wakanda? No, but that they did and that this opening battle comes to a conclusion with a large amount of collateral damage sets in motion a push for tighter restrictions and supervisions over these super heroes. That the meeting of the United Nations to push through this super hero registration act again takes place in Wakanda and is hit by a terrorist bomb that is suspected to have been planted by The Winter Soldier allows for T'Challa AKA Black Panther (Chadwick Boseman) to be provoked enough to dive into the internal conflict that has already been brewing between The Avengers. On the front lines of the push to have earths super-powered beings more or less become government operatives is Tony Stark. Following an unexpected run-in with a grieving mother (Alfre Woodard) that leaves him wracked with guilt Stark calls up old friend Gen. "Thunderbolt" Ross (William Hurt) to help implement this initiative. On Stark's side is long-time friend James Rhodes (Don Cheadle), former A.I. 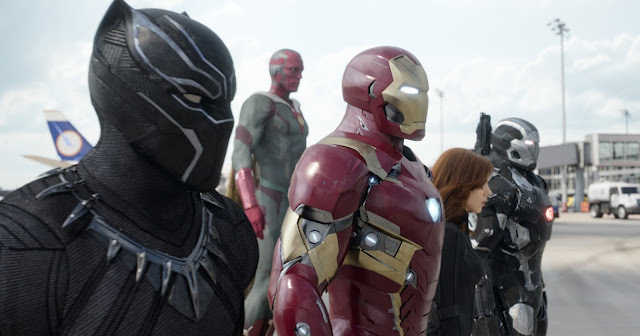 turned fully formed humanoid, Vision (Paul Bettany), with Black Panther falling in line due simply due to his vendetta against Winter Soldier while Black Widow more or less stands beside Stark's views while her heart seems to waver more in Cap's direction. With Bucky (or The Winter Soldier) essentially being pegged as a fugitive to shoot on sight the weight of what it seems Cap should do isn't enough to move him. 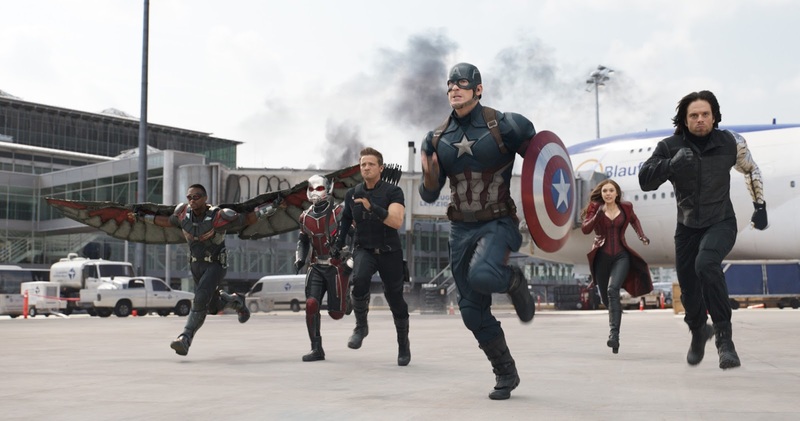 With Falcon firmly on his side, Captain America goes on the run to attempt to figure out the truth of Bucky's past and how it might inform what is happening to him now only enlisting Scarlet Witch, Hawkeye (Jeremy Renner), and Ant-Man (Paul Rudd) when it becomes clear Stark isn't going to rest. What's crazy is that summary doesn't even scratch the surface of all that Civil War contains. I've yet to mention the former Russian military commander Zemo (Daniel Brühl), the ongoing romantic tension between Steve Rogers and Peggy Carter's niece, Sharon (Emily VanCamp), or the small factoid that Marvel's most iconic superhero, the web slinger himself, Spider-Man (Tom Holland), shows up at the insistence of Tony Stark for a scene that will solidify your hope and willingness to follow Spider-Man into a third series of live action films in less than fifteen years. Oh, and did I mention the always charming Martin Freeman is in this movie, too? While all of these facets are attractive and bring an incredible amount of joy to large portions of the experience it was ultimately kind of distracting just how much stuff was actually going on and I began marveling at the fact the Russo Brothers were even able to manage all they had on their plate rather than simply appreciating what they'd actually served on that plate. To push the food analogy even further, a plethora of ingredients are here and the Russo's more or less craft a satisfying dish, but the presentation could have been tighter and a little more pleasing given all it had going into it. In short, I enjoyed Captain America: Civil War a lot and there are even sections of the film I'd say I genuinely loved, but as one cohesive work it is a solid movie that is very good without being great even within the confines of the super hero genre. And still, I feel somewhat regretful in even being that dismissive because when we see the shot of Iron Man and his crew that includes Spider-Man marching towards Captain America and his supporters I turned to my brother who was sitting next to me and flat-out admitted to this being, "insanely awesome." And it is, the spectacle is truly something to behold in a theater-going experience. There is something magical about seeing these beings who a generation watched on Saturday morning cartoons go head to head in a live action brawl and as one of those kids who longed for the days when movies would be as connected as the universe's I became enthralled with in those Saturday morning cartoons I appreciate the willingness of Marvel to be consistent with their connective tissues and largely dismissive of the audience who doesn't care to keep up. The things is-by the time the credits roll and we are delivered the exciting, but obligatory post credits scenes Captain America: Civil War felt more like a fun and engaging genre movie rather than one that transcended the super hero genre to be a great film regardless of its defining descriptors. Iron Man (Robert Downey Jr.) leads his opposing force that includes Black Panther (Chadwick Boseman), Vision (Paul Bettany), Black Widow (Scarlett Johansson) and War Machine (Don Cheadle) against the charge. Always elevating these types of movies is the willingness of the performers. While it is clear the veterans of this series are beginning to lose some of their steam it is their names that still stand tall at the top of the posters and thus I'm sure they don't expect to be going anywhere anytime soon. This is especially true of Downey Jr. who is playing Tony Stark/Iron Man for the sixth time in Civil War while Evans and Johansson are each on their fifth outing as their respective characters. Though it is expected that Stark is somewhat worn down by the onslaught of mishaps that have plagued his attempted retirement since Iron Man 3, not to mention an apparent rough patch with Pepper, but RDJ looks more than appropriately tired. Within his performance there are numerous scenes where it feels as if he is going through the motions, as if playing the same character is so second nature by this point there is really no necessary effort needed. It might only be noticeable in certain instances, but the fact Downey Jr. is only present on set when he's not in the Iron Man costume feels more glaring than ever. Again, I say that, but when it comes to the final climactic showdown between our two prime protagonists where Markus and McFeely try their hand at legitimately dramatic material Downey Jr. drives it home and delivers the necessary impact to make us believe that no matter how much these two opposing forces want to find common ground there are some lines you just don't cross. It is a watershed moment of sorts not just for the events of the story, but for the MCU in general as it marks the first time I was not only invested in the actions of these characters, but their emotions. In some strange way, that likely should have been the ultimate goal of Civil War as it is the first Marvel film willing to give to its characters what they somewhat deserve while keeping their signature self-referential tone in check. 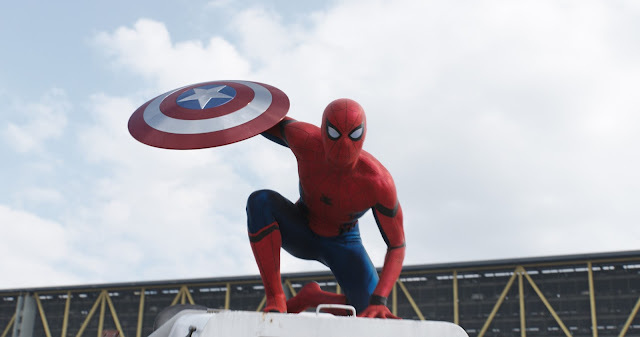 Tom Holland makes his Marvel Cinematic Universe debut as Spider-Man. Credit where credit is due though, the Russo Brothers have crafted a piece of pop culture that will only remain to solidify the zeitgeist of this period in time where, for as much as some may dislike the dominance caped vigilantes have accrued in mainstream cinema, they still remain the unmitigated favorite among the popular vote. Personally, I get excited for these films as much as the next fanboy. I have a lot of fun watching what I imagined as a child come to life and I find a lot of joy in seeing these epic myths adapted for modern times played out on a scope so large they sometimes do rival those Greek epics they draw so much inspiration from. That the Russo's have figured out a way to capture such frenetic and exhilarating action sequences and fight scenes with their cameras trying desperately to keep up with their subjects while at the same time keeping the tension as high as the energy as well as being able to accentuate each individual heroes abilities in effective and interesting ways drives just how skilled they had to be to manage that high-wire balancing act making what a miracle it is they accomplished it that much more astonishing. With all that is taking place on the visual borders of this film it is easy to forget the debate that drives the action, but Markus and McFeely concoct some truly great dialogue scenes that see the themes of the piece coming through in ways that will pull the audience from one side to the other, each respective view making sense for the person speaking it and their past adventures that we've seen inform those opinions. At the risk of sounding like a crabby old critic, if we were to get as much of these dialogue-heavy scenes as we do the giant action set pieces and trim a few of the set-ups for future movies Civil War might have stood a chance to transcend the genre it is so proudly a part of. Maybe it doesn't want to, though. Maybe the Russo's and Marvel are perfectly fine with making a hugely entertaining action film that can be deceptively profound in just enough moments that it registers in unexpected, but welcome ways. If that is the case, they surely accomplished their goal and there is no reason they should listen to anyone but themselves at the moment.